And waged a ten year war for his beliefs. His name and exploits are legendary. Chief Colorades taught him the Apache ways. Of the Butterfield Overland line. He had worked there for quite some time. His people died for things they had never done. Now on a war path the year eighteen sixty-one. Their homeland gone and moved to reservations. Would not surrender his Apache Nation. He held the U.S. Cavalry at bay. Like the wolf he’d strike and get away. In helping his people to survive. Considered a legend even while alive. His integrity and military skill. No one made this man go against his will. Made friends and would be the key to peace. To the mountain stronghold of Cochise. On a reservation Cochise agreed. After these talks this war chief did concede. He, His horse, dog and weapons laid beside. After burying him in secrecy~~ they cried. Another broken promise now at hand. Resting with the spirits that set him free. A hero in Native American’s history. Cochise – his name and exploits were legendary even during his lifetime; today he remains one of the most important names in America’s Western history. And so the Chiricahua Apache chief fought on, long after other tribes had given up their homelands and moved to the reservations. With his band of less than 200 followers, he held the U.S. Army at bay for over ten years before finally agreeing to a peace treaty in 1872, and initially securing a reservation for his people in the same area where they lived, not in some far-off location. 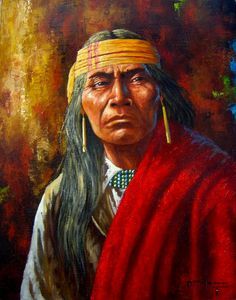 At the height of his power, Cochise led not only his own Chiricahua Apaches but also the warriors of other Apache bands, and today is recognized as one of the most powerful war chiefs in all of history.